What is a Scoping Review? This guide will help you get started with your next systematic review, Scoping Review, or other review types. 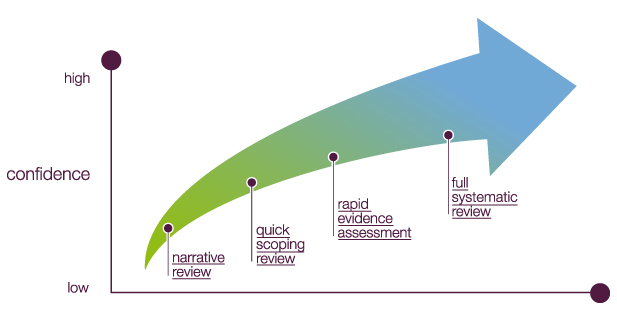 What is a Rapid Review? What is a Mixed Methods Review? What is a Network Meta-Analysis? What is an Overview of Reviews? What is an Integrative Review? What is a Diagnostic Test Accuracy Review? What is a Living Systematic Review? "Scoping reviews have great utility for synthesizing research evidence and are often used to [categorize or group] existing literature in a given field in terms of its nature, features, and volume." Note: Often a scoping review is confused with a mapping review. They are two different types of descriptive reviews and are not systematic reviews, but the methodology is closely related. According to Grant and Booth (2009), Scoping reviews are "preliminary assessment of potential size and scope of available research literature. Aims to identify nature and extent of research evidence (usually including ongoing research)." "When a body of literature has not yet been comprehensively reviewed, or exhibits a large, complex, or heterogeneous nature not amenable to a more precise systematic review." Question: Answers broader questions beyond those related to the effectiveness of treatments or interventions. A priori review protocol is recommended. Sources and searches: Is still as comprehensive as a systematic review but much broader. May involve multiple structured searches rather than a single structured search. This will produce more results than a systematic review. Must include a modified PRISMA flow diagram. Selection: Based on inclusion/exclusion criteria, due to the iterative nature of a scoping review some changes may be necessary. May require more time spent screening articles due to the larger volume of results from broader questions. Appraisal: Critical appraisal (optional), Risk of Bias assessment (optional) is not applicable for scoping reviews. Synthesis: The extraction of data for a scoping review may include a charting table or form but a formal synthesis of findings from individual studies and the generation of a 'summary of findings' (SOF) table is not required. Results may include a logical diagram or table or any descriptive form that aligns with the scope and objectives of the review. May incorporate a numerical summary and qualitative thematic analysis. Munn Z, Peters M, Stern C, et al. Systematic review or scoping review? Guidance for authors when choosing between a systematic or scoping review approach. BMC Medical Research Methodology. 2018;18:143. Peters M, Godfrey C, Khalil H, et al. Guidance for Conducting Systematic Scoping Reviews. Int J Evid Based Healthc. 2015;13:141-146. Morris M, Boruff J, and G Gore. Scoping Reviews: establishing the role of the librarian. J Med Lib Assoc. 2016;104(4):346-353. Khalil H, Peters M, Godfrey C, et al. An Evidence-Based Approach to Scoping Reviews. Worldviews on Evidence-Based Nursing. 2016;00:0,1-6. Arksey H. and O'Malley L. Scoping Studies: towards a methodological framework. International Journal of Social Research Methodology, 2005;8(1):19-32. Pham MT, Rajic A, Greig JD, et al. A Scoping Review of Scoping Reviews: advancing the approach and enhancing the consistency. Research Synthesis Methods. 2014;5(4):371-385. Levac D, Colquhoun H, O'Brien K. Scoping Studies: Advancing the Methodology. Implementation Science. 2010; 5(1). Is not easier than a systematic review. Is not faster than a systematic review, may take longer. Often leads to a broader, less defined search. Requires multiple structured searches instead of one. Increased emphasis for hand searching the literature. May require larger teams because of larger volume of literature. Inconsistency in the conduct of scoping reviews. If you have any questions or need help, contact Stephanie Roth, stephanie.roth@temple.edu, 215-707-9469. You can also use our Ask A Librarian options to get assistance. << Previous: What is a Systematic Review?